Daniel Levy (born 8 February 1962) is a British businessman and the current chairman of Premier League football side Tottenham Hotspur and has been since 2001. Levy was born in Essex. He is a managing director of ENIC International Ltd an investment company, sports, entertainment and media group. 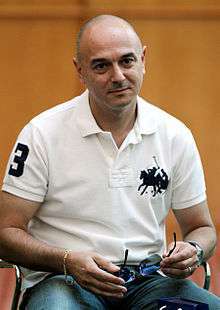 Levy replaced Lord Sugar as chairman of Tottenham in February 2001 after ENIC bought a controlling stake in the club. ENIC is controlled by Joseph Lewis. Levy was formerly a director of the Scottish football club Rangers, in which ENIC held a significant stake. ENIC has also in the past held stakes in other European football clubs including AEK Athens, Slavia Prague and Vicenza as well as non-football companies such as Warner Bros and Autonomy. His reign has seen a succession of managers (George Graham, Glenn Hoddle and David Pleat). With Martin Jol as manager, Spurs finished fifth in the Premier League, (their highest position until the fourth-place finish in the 2009-10 campaign) and the club qualified for the UEFA Cup, a feat they repeated again the following season. However Levy's decision to fire Martin Jol after a poor start to the 2007/2008 season, when many of the players appeared to be unfit, was widely regarded as a rash move by Tottenham supporters. The appointment of a new management team, including the highly regarded Juande Ramos as head coach resulted in some short-lived optimism amongst the Tottenham fans. On 24 February 2008, Tottenham beat Chelsea 2-1 at Wembley in the 2008 Football League Cup Final to win their first trophy in nine years, and their first under Levy's reign, and gain automatic qualification for the UEFA cup. A year later they reached the final for a second successive year, this time losing to Manchester United on penalties. However, at the start of the following season Spurs' league form took a disastrous turn which culminated in their worst ever start to a league campaign in 2008/09. In the late hours of 25 October 2008, Daniel Levy took the decision to fire Sporting Director Damien Comolli, Head Coach Juande Ramos, first team coaches, Marcos Álvarez and Gus Poyet. Levy then installed Harry Redknapp as the new Head Coach of Tottenham. The move proved hugely successful, as a dramatic upturn in Tottenham's form on the pitch saw them steadily climb out of relegation zone to eventually finish in eighth position. Further progress was made in the 2009/2010 season, with Spurs finishing in the top four and winning entry into the qualification round of the UEFA Champions League for the first time. 2010-11 saw another excellent season for Tottenham, as they finished top of their Champions League group, beating holders Inter Milan along the way, and then dispatching AC Milan in the knock-out stages. Their exciting Champions' League run ended at the hands of Real Madrid. Tottenham finished fifth in the Premier League 2010-11 season, missing out on Champions' League qualification but securing a place in the Europa League after overtaking Liverpool with victory at Anfield in the penultimate game of the season. The summer of 2011 was a tough time at Tottenham, with Chelsea trying to sign star player Luka Modrić, however Levy refused to sell. After losing to both Manchester clubs, Spurs won ten of their next eleven Premier League games, drawing the other. The club equalled their best ever Premier League run of six consecutive wins, also achieving their best league start since the double-winning team of the 1960-1 season, gaining 31 points from a possible 39. On 14 June 2012 and after failing to reach the champions league, Redknapp was sacked by Levy despite finishing 4th in the Premier League. On 3 July the club appointed former Chelsea and Porto boss Andre Villas-Boas as new head coach. After Tottenham finished outside the Champions League places at the end of the 2012/13 season, in a protracted summer transfer deal Levy negotiated the sale of star winger Gareth Bale to Real Madrid for a world record transfer fee of £86 million. Following some poor results in the first half of the 2013-14 season, including a 5-0 home defeat by Liverpool, Levy sacked Villas-Boas on 16 December 2013. Assistant coach Tim Sherwood was subsequently announced as manager following the sacking of Villas-Boas. Despite signing an 18-month contract with Spurs, and leading Tottenham to a 6th-place finish in the Premier League, Sherwood was himself sacked at the season's end on 13 May 2014. In October 2008, Levy presented plans for a new stadium for Tottenham Hotspur. The intention was to build it adjacent to the current stadium, White Hart Lane, and for it to hold 56,264 spectators. The new stadium complex would also include leisure areas, public spaces, a museum, restaurants, a supermarket and shops, a hotel and apartments. The development was called the Northumberland Development Project (NDP) and it was projected work could start on the project soon after it received planning permission by Haringey Council, probably at the end of September 2010. However, Levy had also made a back-up bid in conjunction with venue giants AEG to move the club away from the Tottenham area to the upcoming 2012 Olympic Stadium in Stratford, London despite West Ham United expressing an interest in keeping an 'olympic legacy' after the games as desired by Lord Coe. It was widely suggested that interest in the Olympic site was simply to scare Haringey Council into granting planning permission for the NDP in Tottenham. However, over a period of weeks, it was reported that Levy had become more serious about moving to Stratford should Tottenham Hotspur be preferred over West Ham as successors to the site. If Spurs were to come out on top in the bid, the club's plan was practically to demolish the stadium to its foundations and build another one to ensure crowd intimacy and atmosphere (i.e. by moving "ringside seats" closer to the touchlines than could be achieved with a retained athletics running track). During the bidding phase there were allegations of improper behaviour by Tottenham by allegedly hiring private investigators to carry out corporate espionage. West Ham made a complaint to the police after they became aware that these investigators obtained bank and phone records belonging to senior executives at West Ham and the OPLC. Three men have now been charged with fraud and false representation and will face trial in 2014. This proposal met with angry opposition from a large proportion of both Spurs fans and Haringey Council as well as bidding opponents West Ham United. Haringey is one of the most deprived areas in the country and has relied heavily on the Tottenham Hotspur Foundation's charitable work. The NDP was seen as a major boost to redevelop the surrounding area as well as the stadium itself and in turn bring more money into the area. On 11 February 2011, the OLPC announced that West Ham were winners in the bid to use the Olympic Stadium after the 2012 games. Levy and Tottenham are now focused on the NDP again, trying to secure much-needed funding from the public sector to make the project viable. Levy is married to Tracey, and has four children - Joshua, Oliver, Chloe and Gabriella. He has supported Tottenham Hotspur F.C. since he was a child. ↑ "Daniel Levy's genius has given Spurs a chance to finally rein in rivals Arsenal". independent.co.uk. 1 December 2015. ↑ "Murray returns as chairman". BBC Sport. BBC. 27 August 2004. Retrieved 8 March 2012. ↑ "Club Announcement". tottenhamhotspur.com. 25 October 2008. ↑ "Redknapp agrees Spurs deal". Sky Sports. 26 October 2008. Retrieved 25 April 2010. ↑ Fifield, Dominic (16 December 2013). "Tottenham sack André Villas-Boas after humiliating home defeat" – via The Guardian. ↑ "Spurs aim for new stadium by 2012". 26 October 2009 – via bbc.co.uk. ↑ Williamson, Laura. "Man held amid claims Spurs snooped on West Ham during Olympic Stadium bid". Daily Mail. London. ↑ "West Ham calls in police over Olympic 'spies' - The Sunday Times". ↑ Kirk, Tristan (2 April 2013). "Olympic Stadium row in court after alleged Spurs investigators accused of spying on West Ham". Daily Mail. London. ↑ "Daniel Levy: The toughest negotiator in football". Daily Express. 8 September 2013.